Which Water Scale Removal Method Will Work Best – Vinegar, Lime Or Chemical Based Cleaning Agent? The one thing that can really make your home look sparkling clean and beautiful is the hardware you install in the house. But what if, over time, even the best brands in hardware fall victim to a layer of limescale? Do you often see a layer of white milky deposit on your kitchen and bath accessories? Limescale deposits can make them look dirty and disgusting over time. Not just that, once the deposits get tough and thick, it can damage the hardware and also make it difficult to be used properly. But what if there were some really easy and super effective ways to get rid of those hard scaly deposits, instead of having to replace your hardware repeatedly? If you are tired of seeing those hard water limescale marks in your home, we can help! In this article, you can read about some easy DIY methods that will help you to remove limescale deposits from areas such as your kitchen tap, sink, kettle, shower head, toilet bowl, bath, tiles and so on. All the things that you need for these DIYs will be easily available in your home, and barely cost anything. If you want to look for something more other than the DIYs, you can read our section about some of the best cleaning products that are available in the market. We have also shared reviews as well as all the individual pros and cons for each product, to help you decide which one will be perfect for your home. Seeing limescale deposits in your home is not a lovely sight, but with these quick DIY tips and tricks and some super effective products that give great results, your kitchen and bathroom will get back its shine in no time. Last update on 2019-04-23 at 06:41 Product prices and availability are accurate as of the date/time indicated and are subject to change. Any price and availability information displayed on [relevant Amazon Site(s), as applicable] at the time of purchase will apply to the purchase of this product. Limescale is the off-white chalky layer you may have noticed around the taps and faucets in your kitchen and shower. You will usually see it in areas where there is regular flow of heated or warm water, or water that is left standing. The most common areas in your home where you will notice the water scaling problem is the kitchen and bathroom, where water is used most of the time. Some of the problem areas are taps, sink, tiles, kettle or coffee machine, pans, toilet bowl, shower area and so on. Essentially, limescale is a layer of calcium carbonate that forms in areas that are directly and regularly in contact with water. This is more so when the type of water is hard water. There are various factors that could lead to a hard water scale build up. For instance, water can dissolve scale, but it depends on the temperature, the overall pressure as well as the pH level of the water. When the water is hot, it leads to precipitation of the various molecules of scale. If there is already some scale buildup on the surface, these molecules will cling on to the already existing build-up, or else cling on to the plain surface and stick there. This makes the deposits become more hard and difficult to get rid of. The main culprits in water that cause limescale to form are calcium and magnesium. 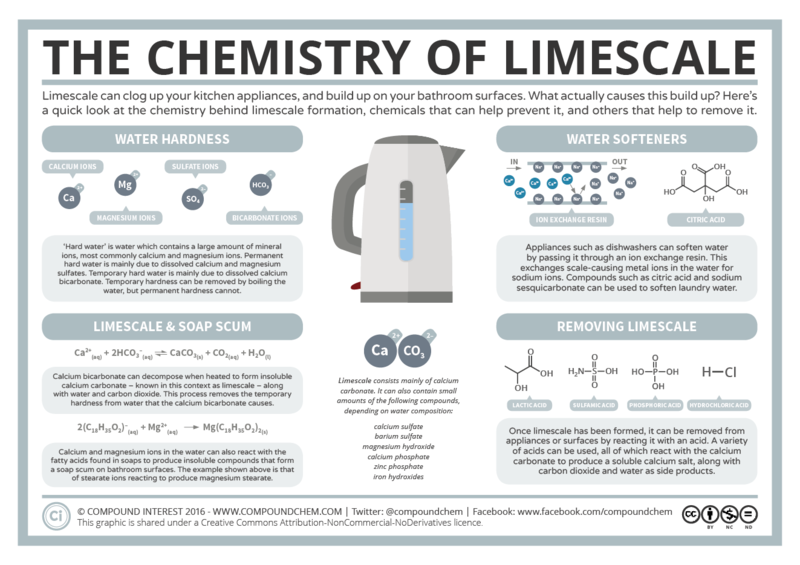 Here is a simpler look at what really goes on in water that can lead to the formation of limescale. Depending on the type of water, limescale can be made up of various minerals such as calcium sulfate, magnesium hydroxide, zinc phosphate, barium sulfate, calcium phosphate, and iron hydroxides. Here is a quick look at what these essentially are. Calcium sulfate – This is not properly soluble in water and makes it permanently hard. Magnesium hydroxide – Responsible for making the water hard. Zinc phosphate – Even though small traces may mix with water, it usually breaks down when it comes in contact with water. Barium sulfate – This is not at all soluble in water. Calcium phosphate – The solubility of calcium phosphate depends on the pH level of the water. Iron hydroxides – It is very poorly soluble in water. By now, you probably already know or have realized that if you live in an area where you get hard water, you are up for some pretty tough limescale stains and deposits. Water contains various minerals, but when it is hard water, the minerals that are found in it are very high in concentration. This is a mix of various dissolved minerals such as magnesium and of course, calcium, and the concentration levels are significantly higher than what it should ideally be. An easy way to find out if you get hard water in your area is to do the lather test. If the water helps make lather easily, it is soft water. If it is difficult to make lather with the water, it is hard water. Once water evaporates, the calcium present in it is left behind in the form of a light layer on the surface. However, when the water is hard water, the concentration of calcium will be very high, and the layer of calcium carbonate that it leaves behind will also be very thick and visible. In the case of hard water, the calcium carbonate deposits build up faster than in the case of regular water, and over time, these can be very difficult to get rid of, especially as limescale tends to stick very tightly to limescale. Are you constantly worried about how to remove water scale build up? Here are three very effective, easy and popular ways that you can use to remove the limescale deposits in your home, specifically in the kitchen and bathroom area. Take a look and choose the one that suits you best. Different types of vinegar, such as distilled white vinegar, apple cider vinegar and malt vinegar can be very effective in removing limescale buildup. The acid in vinegar makes it great for cutting through tough grease and stains, including limescale deposits. Not just that, it also acts as a natural disinfectant, making it perfect for cleaning your kitchen and bathroom areas. Did you know that cleaning with vinegar can also help you battle many household bacteria such as E. coli and salmonella? The best part about using vinegar for treating any limescale deposit is that you can use almost any type of vinegar, whichever may be available in your kitchen. Vinegar contains acid that crosses through the cell membrane of bacteria. As a result, it releases protons, which makes the bacterial cells die almost instantly. As per your requirement, you can either use the vinegar as it is, or dilute it with water for using on milder stains and deposits. Distilled white vinegar – It is the type of vinegar which is made from grain that has been ripened in the sun, as well as a mix of crystal clear water. Distilled white vinegar is a type of clear liquid and has no colour. Apple cider vinegar – Apple cider vinegar, as the name suggests, consists mainly of apple juice. During its making process, yeast is also added to the mix, which makes the fruit sugar turn into alcohol. This process of mixing yeast and getting the resultant mix is known as fermentation. During the fermentation process, the bacteria further help the alcohol to turn into acetic acid, which is what adds to the distinctive strong smell as well as taste to the vinegar. Malt vinegar – Malt refers to the grains of barley that have been dried as well as germinated. In that sense, malt vinegar is essentially the type of vinegar that is made out of malted barley. It has a very strong toasty and nutty flavour. Malt vinegar is made from ale, and through the process, the alcohol is fermented to help turn it into vinegar. Malt vinegar tastes sweeter than regular white vinegar, but the flavour and smell is milder as compared to the white one. 1. Take the ziplock bag and wrap it around the shower head using rubber ties. Leave some space around the opening to attach the nozzle of the funnel. 2. Place the funnel and pour the vinegar in such a way that it covers the shower head till where you want it cleaned. 3. To get the best results, leave the mix like this for a day, preferably for at least 20 to 24 hours. 4. Wear your rubber gloves and carefully remove the bag from around the shower head. Be careful to make sure that the deposits do not fall out of the bag. 5. Spray the water and vinegar mix on the shower head and use a scrubbing brush or old toothbrush to scrape off any residual limescale. 1. Take off the shower head and place it in the bucket. 2. Pour vinegar over the shower head and make sure that it is covered properly in the vinegar. Let the shower head remain soaked in the vinegar overnight. 3. Use the toothbrush to scrape off the limescale deposits in the morning. 1. Pour the vinegar on the washcloth so that it is completely wet. 2. Wrap the cloth around the areas of the sink tap where you can see the limescale build-up. Try to push the cloth into any loose spaces so that the vinegar can reach even the remotest area and help to properly clean the deposits. 3. Once the washcloth is in place, pour some more vinegar on it and leave it like this for at least 1 to 2 hours. 4. Scrub off the deposits with the toothbrush and pour some water to help remove any residual deposits. Try and reach into every corner that you can. 1. Soak the paper towels in vinegar and place them on the sink tap. Make sure that you press them down properly on the sink tap, so that it reaches all areas wherever the limescale may be present. 2. To get the best results, let the soaked paper towels sit like this for at least 2 to 3 hours. 3. Use a wet cloth to wipe off any residue. 1. For best results, you have to first try and reduce the water in the toilet bowl as much as you can. This might seem a little disgusting, but if it is possible, wear rubber gloves and scoop out the water. You can do this by using an old plastic bottle with a wide mouth, and once done, you can simply dispose of it. 2. Once the level of water is less than what it was earlier, pour the vinegar in the toilet bowl and let it sit for about 6 to 8 hours. For best results, let the vinegar sit overnight in the toilet bowl if possible. 3. If you want to make sure the vinegar reaches a certain area to clear out the deposits, you can put the toilet paper in the vinegar and make it sit around that area. The vinegar will seep through the paper and reach the spot where it might not otherwise reach. 4. In the morning, or after the desired number of hours, use the scrubbing brush to clean the full toilet and remove any residue of limescale. 5. Flush the toilet after you have scrubbed it, to get a clean and shiny toilet bowl surface. 1. Mix vinegar and borax powder in the old bottle to make a strong homemade liquid cleaning agent. 2. Pour this mix in the toilet bowl. Now let it sit for 3 to 4 hours to get the best results. 3. Once done, scrub the toilet bowl to get rid of any limescale deposits. 1. Pour about three cups of undiluted white vinegar in the toilet bowl when it is full. 2. Let it sit for about 1 or 2 hours and scrub off with a toilet brush to remove the residual deposits. 1. Spray the water and vinegar mix on the areas where you can see the deposit. 2. Let it sit for 2 to 3 hours. Lemon juice contains a substance known as d-limonene. This is a natural solvent (something that can help to dissolve any other substance) which helps to break up the tough grease and dirt, and acts on the various deposits and stains. The citric acid present in lemon is what gives it the distinct sour taste. This same citric acid is also what makes it such a good and effective natural cleaning agent. The citric acid present in lemons can help to effectively remove the various stains that are often caused by other acids. The acid content in the lemon juice reacts with the limescale buildup, and it helps to make them softer, making it easier to dissolve the deposits. Another very good thing about lemons is that they have very strong anti-bacterial properties. This means that, even as you use it to remove the tough and disgusting limescale buildups from your home, at the same time it also helps you to eliminate a lot of the bacteria that are often found in the area. The acidity present in lemons makes it difficult for various types of bacteria such as E.coli and more to remain active, even though it may not kill them. The same acidity in lemon juice also helps to remove a lot of the bad and mouldy odours that may be present in areas that have buildup. It is also helpful to remove the odours that come out of alkaline substances. The best form of lemon juice to use here would be the fresh ones that you can simply cut up at home, or squeeze to get the juice. If you don’t have lemons easily available at home, you can even use any store bought lemon juice that you may be using for cooking. 1. Add the lemon juice and water in the kettle. Next, move the kettle in such a way that the mix reaches in most areas and let it come to a boil. 2. Let the mix cool inside the kettle. 3. Once the mix has cooled down, pour out the water and lemon juice and rinse the kettle under the tap. 1. Pour the lemon juice in the kettle and add a cup of water. Let it sit for half an hour to an hour. 2. Now add one more cup of water, close the lid and move the kettle in such a way that the mix reaches to most parts of the kettle. Now, bring the water and lemon juice to a boil. 3. Once it starts to boil, turn off the heat and let it all cool down inside the kettle. 4. Pour out the water and lemon juice mix from the kettle and rinse it for a few times under the kitchen tap. 1. Cut up a lemon in half and rub the entire sink tap with the juicy part of the lemon. Make sure that you try and reach all areas where there may be any buildup. 2. Let the lemon juice sit like this for 5 minutes and wipe off with the cloth. 3. This process will work best if you have mild limescale buildup and may not work on very tough and thick scales though. 1. Cut up a lemon in half and squeeze the half into the toilet bowl. 2. Sprinkle the coarse sea salt into the toilet bowl and let it sit for about 1 to 2 hours. If you feel the deposits are too tough and thick, you can also add some baking soda or borax powder to the bowl. This will help to break up even the toughest of scale buildup and stains, especially when you use it together with lemon juice. 3. Next, scrub the toilet bowl with the toilet cleaning brush to remove any stains and deposits. 1. Cut the lemon in half and spray the lemon juice on the tiles so that it targets all those areas where you see any deposits and buildup. Now let it sit for about 10 to 15 minutes. 2. Take the cloth and make sure it is damp. Use this to wipe the tiles and remove any mild deposits. Again, this process will work best if you have mild limescale buildup and may not work on very tough and thick scales though. 1. Cut the lemon in half and rub the juicy part of the lemon all over the bathroom faucet. Make sure to reach into all the areas and corners so that any residual deposit can also be removed. 2. Let the lemon juice sit for 5 to 8 minutes. 3. Take the clean cloth and make sure it is a little damp. Use this to nicely wipe on all the areas to remove any residue. While most people are now talking about using more of natural and green resources, sometimes, you just need that additional help of a product that may contain some amount of chemicals in it. If you have limescale deposits around your home, not only can it look bad, it can also have potential health effects if left for a long time. It is possible that you have tried the more natural methods of using vinegar or lemon juice, but are not happy with the results. At such a time, it is a good idea to give some store-bought products a try. Most of the limescale remover products that you find in the market will come in a liquid or a ready to use tablet form. Depending on your requirement and ease, you can choose which type you want to go ahead with and what will work best for your home. 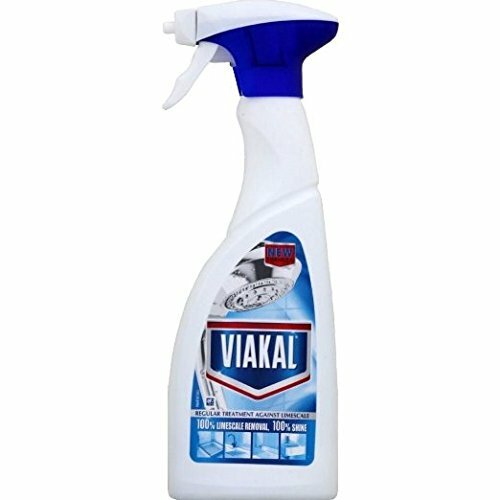 The Viakal Limescale remover spray can be used to remove any hard water marks and stains as well as dissolve any limescale build-up. It will help to cut through any grease and deposits and will also leave the surfaces of your fixtures looking all shiny and clean. This limescale remover will not only help to remove the deposits but will also prevent any new limescale deposits from building up if you use it on a regular basis. Not as strong as maybe other limescale removers available in the market. The Lime A Way bathroom cleaner will help to remove all hard water stains as well as limescale stains and deposits. In addition to the limescale deposits, it will also help to remove any calcium stains that may be present in the area. This bathroom cleaner is perfect to clean areas in your bathroom such as sinks, wash basins, faucets and the different types of fixtures and taps. It comes in an easy to use spray bottle and claims to work 4 times more on the limescale deposits than other similar bathroom cleaners that are available in the market. No need to scrub the areas after applying the cleaner. Removes hard water as well as limescale stains and deposits. Perfect for cleaning bathroom sinks, wash basins, faucets, fixtures and taps. May not show complete results with first time use. You may have to use it repeatedly at least for the first few times to get the best results. The product may sometimes clog and not spray properly. 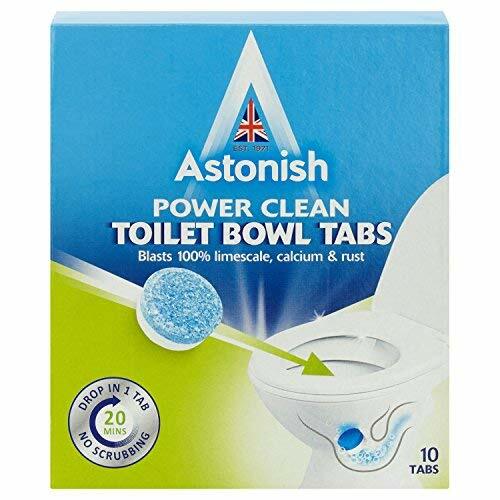 The Astonish toilet bowl cleaner comes in the form of cleaning tablets and is especially good for removing limescale deposits and stains that form in the toilet bowl. In addition to removing the scales, it will also help to deodorize the toilet area and give a cleaner look to your toilet bowl. The cleaning tablets are not long-lasting, which means that to get the best results, you will have to use them on a regular basis. The best way to get the most out of this cleaning agent is to leave the tablet overnight inside the toilet bowl. In the morning, all you have to do is to scrub the area with a cleaning brush and get rid of any residual scales. As it comes in a tablet form, it is easier to use and does not lead to any wastage. If you feel you have very thick and tough stains, you can also use two tablets instead of one, at least for the first few times. Once the stains build up less frequently, you can use one tablet on a regular basis. Comes in the form of cleaning tablets. It is easier to use and helps to avoid wastage. ​Is especially good for removing thick limescale deposits and stains. ​Also helps to deodorize the area. Will have to use on a regular basis to get best results. 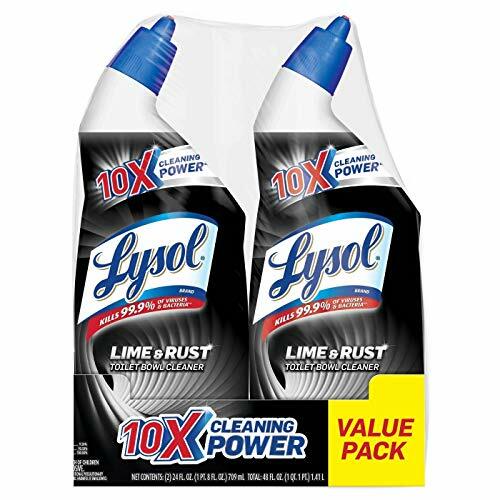 The Lysol Lime & Rust Remover Toilet Bowl Cleaner claims to work on your limescale deposits and stains faster than most other similar cleaners that are available in the market. It is especially good on the limescale deposits that form stains around the toilet bowl ring. The bottle is shaped at an angle that makes it easier for the nozzle to reach areas that are otherwise difficult to clean, making sure that all stains and deposits are targeted and removed. The toilet cleaner also helps to deodorize the area and helps to remove any unpleasant smell. In addition to the limescale deposits, this toilet bowl cleaner also works on the hard water stains. Works faster on limescale deposits and stains than most similar cleaners. ​Especially good on limescale deposit stains around the toilet bowl ring. ​The angle shape of the bottle helps the nozzle to reach difficult areas and remove stains. Helps to deodorize the area. The smell may seem too strong to some. 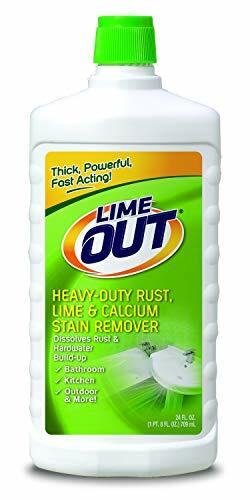 The Lime Out Lime Calcium Rust and Mineral Deposit remover works great on your limescale stains and deposits, as well as on other mineral and calcium stains or even rust stains. The formula works well to dissolve and break up even the toughest of scales. The liquid comes in a ready to use form and can be used on various vertical surfaces. The thick formula sticks longer and firmer on the most difficult of stains and helps to give you the best cleaning results. This thick formula is best suited to use on your bathroom showers, bath tiles, various cookware, kitchen and bathroom sink, sink taps as well as any fixtures or other surfaces that you have in the kitchen or bathroom area. Works great on limescale stains and deposits, mineral and calcium stains as well as rust stains. ​Dissolves and breaks up the toughest of scales. ​Comes in a ready to use form. Can be used on various vertical surfaces. Thick formula sticks longer on tough stains. The product can actually turn out to be runny and may not be as thick as it claims. The smell can feel strong to some. 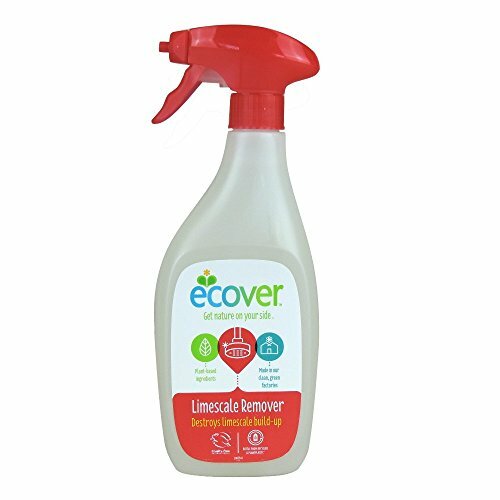 The Ecover Limescale remover is perfect for use in bath and shower areas as well as on the taps, sinks, tiles and toilet bowl. It helps to remove all stains and deposits of limescale and scum and will leave a clean shine on the surface. The formula helps to create a foamy effect that will stick better and for longer on the surface and will help to take off even the toughest of stains and deposits. Perfect for using in bath and shower areas, taps, sinks, tiles and in the toilet bowl. ​Leaves a clean shine on the surface. ​It sticks longer on the surface and helps to take off even the toughest of stains and deposits. The smell can be very strong for some. 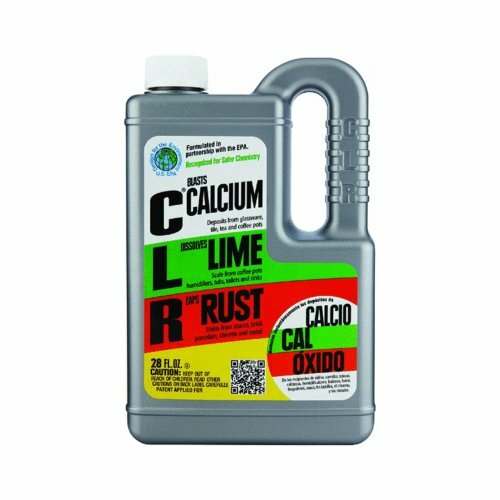 The Calcium, Lime and Rust remover, as the name suggests, is perfect for removing any stains and deposits caused by hard water. It is especially good for removing stains from the tiles as well as from the fixtures in your bathroom and kitchen areas. This particular remover works faster on stains and deposits as compared to other similar products that are available in the market. It is safe to be used in the septic tank too. Perfect for removing any stains and deposits caused by hard water. ​Works faster on stains and deposits as compared to other products. ​Safe for use in the septic tank. May not always give the promised results as fast as it claims to work. The type of cleaning agent you want to use at home to remove the limescale buildup will often depend on the type of stains that you have. In many cases, using vinegar can be the best choice, as it is very easily available and is present in most homes, is absolutely natural and is also very cost-effective. However, the one downside to this could be the strong acidic smell that is associated with vinegar. Using lemon juice can also be a good choice, when you have mild stains in your bathroom or kitchen areas, and want to remove them using a natural cleaning agent. The best thing about using lemon juice is that it has a strong and pleasant citrus scent that also helps to uplift your mood, as well as removes any odours. While the store bought cleaning agents do promise great results, they also contain chemicals. For some people, this is good, because it will help to remove the toughest of stains and deposits. But for some people, this could be a problem, because most of these cleaning agents can have a very strong chemical scent that can lead to shortness of breath, breathing difficulties and even a feeling of choking in those who are not accustomed to such smells. The best option here would be to choose a product that comes with a nice fragrance.